The soul music of Philadelphia conjures images of male groups like the O’Jays and Harold Melvin and the Blue Notes with Teddy Pendergrass. But make no mistake: women put the City of Brotherly Love on the gospel music map. Of course, the Dixie Hummingbirds and the Sensational Nightingales, two of the most important male gospel quartets of all time, made their home in Philly. So did pioneering gospel hymn writer Reverend Charles A. Tindley. But on the whole, female singers and groups represented Philadelphia on a national level. Several left an indelible impression on generations of R&B, rock, and soul singers in the process. The roots of Philadelphia gospel music history can be traced to the pioneering work of two women: Mary Johnson Davis and Gertrude Ward. Although not well remembered today because their recording career ended around 1951, the Mary Johnson Davis Singers were nevertheless revered by contemporaries and churchgoers alike. Davis, born in 1899 in Pittsburgh, moved to Philadelphia in the 1950s and made her mark during gospel’s golden era (1945-70). Eugene Smith, manager of the world-famous Roberta Martin Singers, once told me that Davis’s majestic soprano and profound influence on gospel could not be overestimated. In addition to its collective achievements, the group launched members Jeff and Charles Banks and Frances Steadman to gospel careers of their own. Born in South Carolina in 1901, Gertrude Ward migrated to Philadelphia with her husband George about 1920. In 1934, she and her pre-teen daughters, Clara and Willa, appeared for the first time in public as a singing trio. The Wards made such a splash at the 1943 National Baptist Convention that they began receiving invitations to sing across the country. Their first record, an independent pressing of Mary Lou Coleman Parker’s “Jesus” (as by “Gertrude Ward and Daughters”) led to a contract with Savoy Records. Soon, the renamed Famous Ward Singers added Henrietta Waddy and Marion Williams to their ranks. Williams’ swooping high notes were the acknowledged inspiration for Little Richard’s own stave-jumping screams. Frances Steadman of the Mary Johnson Davis Singers and Kitty Parham followed Waddy and Williams into the Ward lineup. For material, the Wards dipped into the composition book of gospel songwriter Reverend W. Herbert Brewster, whose East Trigg Baptist Church in Memphis was a popular hangout for a young Elvis Presley. They made his “Surely God is Able” and “The Old Landmark” gospel hits. Readers unfamiliar with gospel music will know “The Old Landmark” from James Brown’s church scene in the 1980 film The Blues Brothers. The Wards’ appeal extended beyond their sound. In live programs, the ladies wore eye-catching dresses with perfectly coiffed hair and showcased a stage swagger that couldn’t help but inspire 1960s girl groups like the Supremes, the Shirelles, the Ronettes, and Philly’s own Three Degrees. As Gertrude shepherded her Ward Singers around the country, she was mentoring another gospel group back home, the Davis Sisters. Comprised of Audrey, Thelma, and Ruth “Baby Sis” Davis, and friend Jackie Verdell, the Davis Sisters of Philadelphia developed a sizable following through their extroverted approach to gospel music. Appearances at Philly’s Metropolitan Opera House (the “Met”) and a stack of singles for Gotham Records, including “By and By” and “Jesus Steps Right In,” further fueled their success. On Gertrude’s recommendation, the Davis Sisters moved to Savoy Records in 1955. For the rest of the 1950s, the Wards and the Davis Sisters were Savoy’s top gospel artists. Indeed, they were among the top-selling gospel recording artists in the nation. But despite radio hits and lucrative engagements, the Ward Singers experienced a human resource crisis. Frustrated with Gertrude’s tight-fisted hold on her pocketbook, Williams, Steadman, Parham, and new member Esther Ford walked out en masse. “We resigned as a group, everybody resigned at one time,” Ford told me in a 2011 radio interview. Along with Waddy, who had already left the Wards, the ladies organized the Stars of Faith in September 1958. Ford served as the group’s manager and official driver. Since Parham had cleverly kept a handwritten address book of booking agents from her Ward Singers days, the Stars were up and running quickly. Savoy signed the splinter group, releasing albums on them collectively and on Williams individually starting in 1959. Just as the Wards built their success around the Reverend Brewster songbook, the Stars of Faith did the same with songs from another gospel song composer from Memphis, Lucie Campbell. The Stars’ renditions of Campbell’s “Touch Me Lord Jesus,” “In the Upper Room,” and “Something Within Me” challenged the Ward Singers for radio primacy. By the early 1960s, Marion Williams and the Stars of Faith were taking gospel to Europe and Australia as members of the cast of Langston Hughes’ musical, Black Nativity. “Touch Me Lord Jesus” helped jumpstart the national career of the Angelic Gospel Singers, another Philadelphia female gospel group. The piano-led quartet was formed in 1944 by Margaret “Babe” Allison. While singing with the Spiritual Echoes, Allison dreamt that she should start her own group and call it the Angelic Gospel Singers. Responding to the call, Allison recruited her sister, Josephine Wells McDowell, and two members of the Spiritual Echoes, Ella Mae Norris and Lucille Shird, to form the group. The Angelics’ first recorded single, 1949’s “Touch Me Lord Jesus,” was an immediate smash hit for Gotham Records. The disc’s proto doo-wop vibe even landed it on Billboard’s R&B charts—unthinkable for a sacred record at that time—and is alleged to have sold more than a million copies. It placed the Angelics squarely on the gospel highway, touring and recording alongside the Dixie Hummingbirds. The first gospel star to successfully cross over from gospel to secular, Sister Rosetta Tharpe made her home in Philadelphia starting in 1957. She complimented her evangelistic singing with electric guitar solos that still echo in the work of rock icons like Eric Clapton. Indeed, legions of English rockers learned guitar licks by emulating Sister Tharpe, who has only in the last dozen years or so earned her props for influencing rock ‘n’ roll. 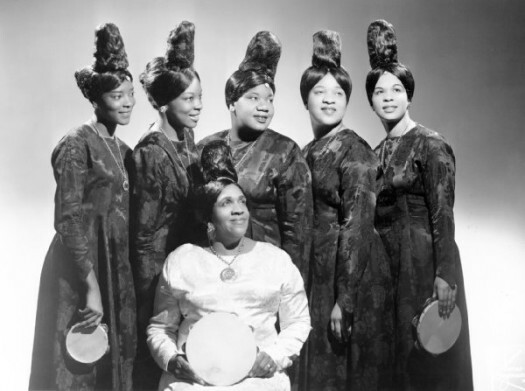 Organized by Anna Smallwood in the 1950s, Philadelphia’s Imperial Gospel Singers evoked the hard-driving churchy sound of the Ward Singers and the Davis Sisters. Their string of radio singles included the rollicking 1958 “My Father’s House,” a song that stimulates congregational singing to this day. The lead singer of “My Father’s House,” Evangelist Rosie Wallace, went on to organize Philly’s First Church of Love, Faith, and Deliverance. Along with her church choir, Wallace produced several singles and albums for Savoy throughout the 1960s, most notably the thunderous “God Cares” from 1963. Until her untimely death in 1973, Clara Ward straddled the fence with more agility than most. Just as the Ward Singers brought gospel into nightclubs and amusement parks—places where gospel had not gone before—Clara could as effortlessly drive a church classic like “The Old Landmark” as belt out the Beatles’ “Help!” Aretha Franklin was among the many artists who counted Clara Ward as an inspiration. That leaves us wondering: could Aretha Franklin’s glass-shattering high note on her 1969 single, “Think,” have been an acknowledgement of Williams? Regardless, “Think” evokes the same sparkle and drive shown by Philadelphia’s female gospel singers. Like Franklin, they were tough, independent, resilient, and responsible for paving the way for today’s female rock, R&B, and soul artists.